Glass Bottles of Beer Become Building Blocks and Save Space. There’s a reason beer bottles are shaped like they are – they fit perfectly into the palms of our hands and are easy to pour without spillage. But their design only takes into account the short period in which they’re actually in use, rather than considering what will happen to them when their contents are all gone. Here are two unusual designs for beer bottles that would make it much easier to build glass bottle structures, from simple greenhouses to astonishingly complex Buddhist temples. 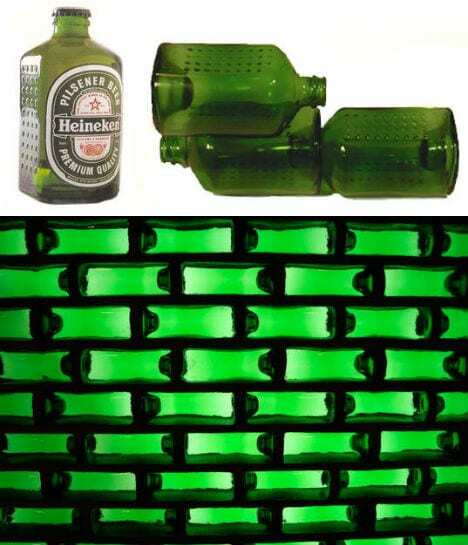 The Heineken WOBO (World Bottle) put the Cradle-to-Cradle design and manufacturing philosophy into use long before its creators, William McDonough and Michael Braungart, came up with the idea. Beer brewer Alfred Heineken was inspired to create it after witnessing both recycling problems and a lack of building materials in the Caribbean. The WOBO bottle is rectangular with a niche in the underside that fits the neck of another bottle, so they’re easy to stack. Unfortunately, the Heineken brewery didn’t support the idea and the bottles never took off. Now, there’s the Heineken Cube by French industrial designer Petit Romain. Not only does this simple cube design eliminate the annoyance of bottles clinking together in a six-pack and make them easy to stack, it also has building potential. The only negative is that square would be kind of hard to get a grip on, especially when the bottle is wet with condensation, so it would probably be best to pour the beer into a glass before drinking. Glass beer bottles have a lot of potential to create incredible, light-filled recycled structures. There’s an entire village made of beer bottles in Simi Valley, California, built by Tressa Prisbey. 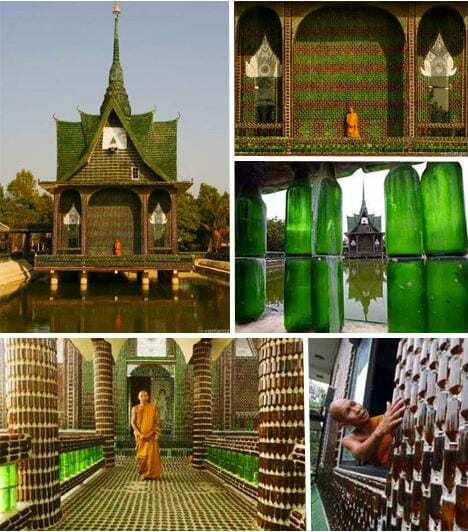 And who could forget the astonishing Buddhist temple made from bottles in Thailand’s Sisaket province? As these structures and many more prove, any kind of beer bottle can be upcycled into a colorful building material, but designs that make the process easier might just result in even more cool low-impact buildings. by Stephanie – author on WebEcoist – her work tends toward the design side of things, covering everything from parks and scenic overlooks to dazzling futuristic eco-architecture. Here is a list of Archived Articles from Stephanie.